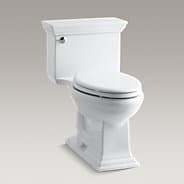 The Kohler Highline Classic Comfort Height Toilet, as the name suggests, is designed to be as comfortable as possible. It has two specific features that make it more comfortable than standard toilets. The first is the fact that sitting on it is a lot like sitting on a chair. It’s not low to the ground like old-style toilets. The second is that it has a longer bowl than other toilets. This makes it a perfect choice for elderly people or anyone with balance problems. In addition to its focus on comfort, this is also a water conservation toilet. It only uses 1.28 gallons of water each time you flush it. Its special design and use of gravity help to give it a powerful flush, despite the lower water volume. So, if you are interested in conserving natural resources, this is a great choice for you. The Kohler Highline Classic Comfort Height Toilet is specially designed to only need one flush. It’s almost impossible to clog, thanks to its strong, gravity-driven flush power. That same power ensures that the bowl is fully rinsed on every flush. So, the chore of cleaning the toilet is one that you won’t have to worry about very often anymore. Click for more information on the Kohler Highline Classis Comfort Height Toilet. The Kohler Memoirs Classic Comfort Height Toilet will fit right in with any traditional or classic bathroom décor. Its design is based on a combination of the aesthetics of crown molding, saving as much water as possible, and providing the comfort and safety that can only come from sitting on a toilet that is at a chair-like height. The height of this model is perfect, especially for adults and the elderly. There is no need to struggle to stand up or sit down, as you might with a low toilet. The bowl is even elongated for extra comfort and balance while seated. The Memoirs Classic Comfort Height Toilet isn’t just comfortable; it’s also efficient in a variety of ways. Its one-piece design makes it easy to clean. In addition to that it has been specially designed to conserve water by using only 1.28 gallons per flush. Many non-efficient toilets use 3.5 gallons. That difference will quickly add up. Despite the lower amount of water used, the Memoirs Classic Comfort Height Toilet flushes with maximum efficiency thanks to the combination of an efficient flush valve, the force of gravity, and AquaPiston canister. The AquaPiston canister allows water to flow from every side of the bowl, allowing efficient flushing and reducing bowl residue. 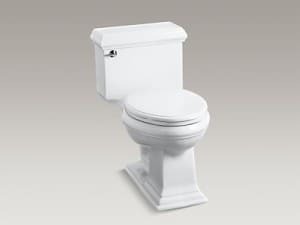 Click for more information on the Kohler Memoirs Classic Comfort Height One-Piece Elongated Toilet. If you have or are trying to design a traditional, elegant bathroom, the Memoirs Stately toilet would be an excellent addition to it. Its clean, streamlined design is certainly elegant, but without being overstated and obvious. So, it can be used to create the perfect clean, aesthetically pleasing look, especially when combined with other Memoirs line products. One of the features that makes the Stately toilet so special is that it isn’t just designed to look good. It is also designed to function with top efficiency. 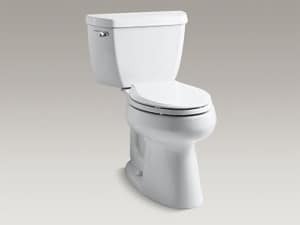 While many standard toilets have a 3.5 gallon tank, the Stately can be flushed using only 1.28 gallons. You might think that using less water means less flush efficiency, but that’s not the case at all. The Memoirs Stately toilet uses an AquaPiston canister, which sends water flowing in from every side of the toilet when it’s flushed. Combined with the powerful, gravity-based flush design means that you should never require more than one flush. This toilet is also designed with both comfort and easy cleaning in mind. The longer seat design and added height make it easy to use. Meanwhile, the Quick-Release™ cover system allows you to remove the toilet lid with minimal effort, making cleaning a breeze. Click for more information on the Memoirs Stately Comfort Height One-Piece Elongated Toilet.